Finally, I’ve turned the calendar to October. I can now officially recognize the fact Autumn is here. I know this sounds pretty mundane, given that Fall is an annual occurrence. But for me, this year is special. For the first time in many years, I will not be deploying to a war-zone during Fall. In their wisdom, the powers that be have historically chosen me to spend so many of my Autumns in a dusty Middle Eastern desert. I’ve missed out on all the wonder of changing leaves, cool breezes, corn mazes, and pumpkin spice lattes. So this year is pretty special for me, as I have a lot of Autumn to make up for the last few years. Finish the Army 10 Miler: This is my first and foremost MUST. The #ArmyTenMiler is a well-organized and motivating race featuring some of the military’s best athletes, wounded warriors…..and me! A few years ago, my husband and I finished it in under 2 hours, which I consider a huge accomplish for me. We are signed up, and ready to tackle this run again on Sunday. Use Whole Pumpkins: There is nothing like the flavor fresh Pumpkin gives to pies, cakes, breads and soups. While this is definitely more laborious, its worth the effort. Plus, I’ll have Pumpkin Seeds available for roasting. (Stay tuned for a blog post on breaking down whole pumpkins). Go Apple Picking: In addition to pumpkin, Apples are my other go-to fall flavor. The bargains I can get right at the source make it much easy to justify the apple strudels and pies I’ll eat all season. 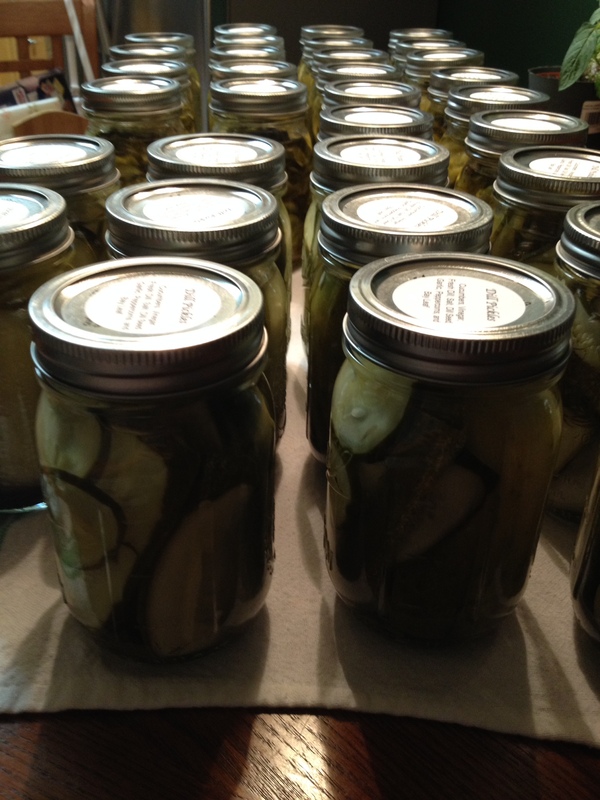 Canning and Preserving: Every year at Christmas I give friends and family a variety of homemade canned goods. These include pickles, applesauce, cranberry sauce, and a variety of salsas. I want to keep up this tradition, and try a few additional care package add-ins, like homemade granola and a few cookies. Have a GREAT Thanksgiving: This is specially important to me, as we are hosting a foreign exchange student from Germany. Thanksgivieng is one of the truly Americans holidays our student has never experienced. I want her to understand the origins of the holiday, stuff herself silly on the traditional feast, laugh at the parades, and be confused by American football. I think I’ve set myself up with some great (and obtainable) goals this Autumn. Although there are many more things I want to accomplish, I really just want to enjoy the season. What else is on your list!?! Oktoberfest. The annual German event celebrating the Autumn tapping of the previous Spring’s märzen beer brew. Many images come to mind when one thinks of Oktoberfest; beer is usually the first on any list. For me, I love the sight of little girls in dirndl dresses, and grown men in short-pant lederhosen. And as a good German girl myself, married to a proud Bavarian, the bright blue diamond flag of Bavaria is the trademark I recognize most. While Munich hosts THE Oktoberfest for the planet, many communities throughout Germany and more, host their own version of the fall festivities. While no other can be quite like the one in the Bavarian capital, its easy to enjoy the celebrations publicly or privately. Beer, yes real Munich märzen beer, is the foundation for any individual’s homage to Oktoberfest. But food also plays a large role. Food musts include giant Pretzels, white sausage (Weisswurst) and lots of sweet, grainy mustard. 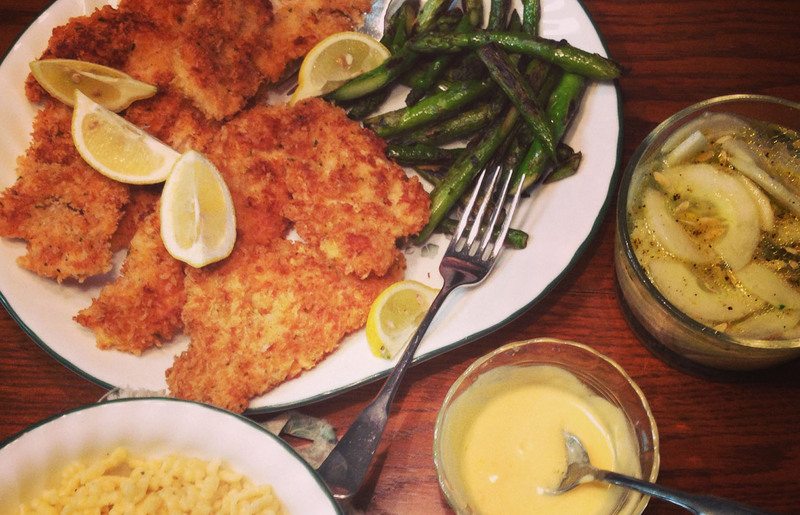 A great addition to any Oktoberfest menu should include piles of chicken schnitzel. 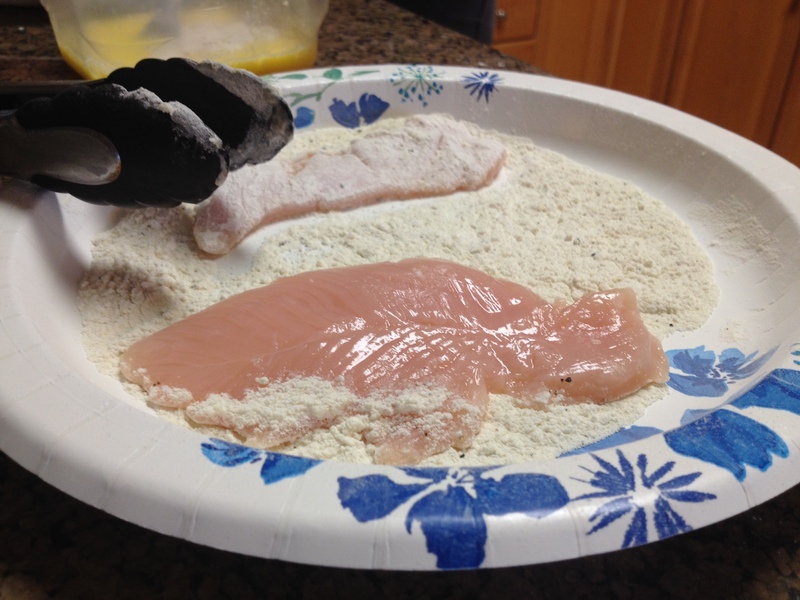 Chicken Breasts are the traditional cut used in schnitzel, but I find boneless, skinless Chicken Tenderloins are an easier piece to work with. Trim the fat from the Chicken and place in a large plaster zipper bag (Ziploc). Leave enough spare room in the bag. 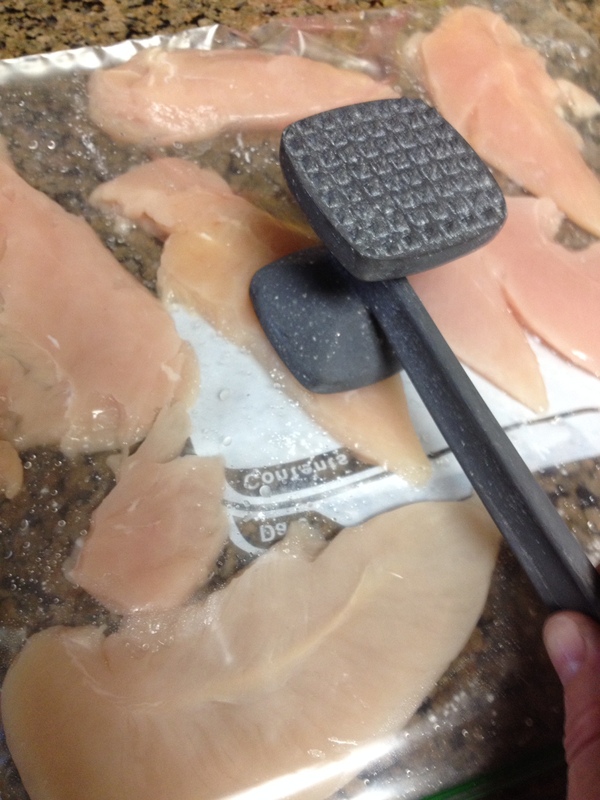 Then use the mallet (flat-side) to pound the Chicken in flat, even pieces, about 1/4 inch thick. 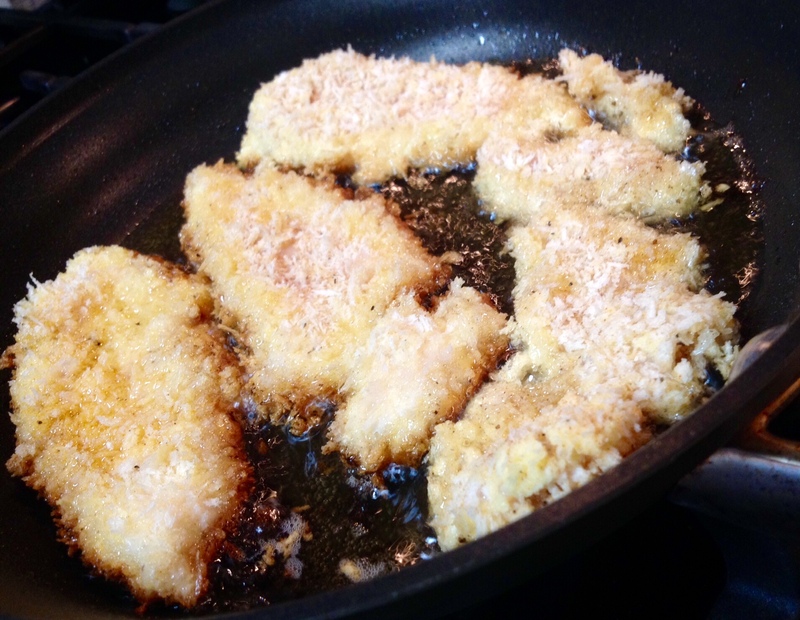 What makes schnitzel….schnitzel, is the crispy breadcrumb coating. This similar procedure can easily also be adapted to eggplant parmesan or chicken fried steak. The key is setting up each breading station. 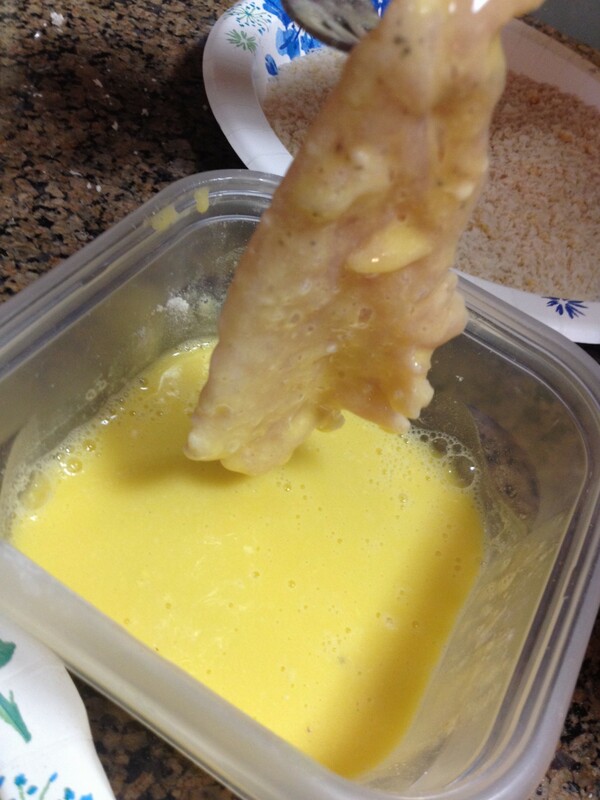 Coat or dip the chicken (using a fork or tongs is easiest) in each station. As you move from one station to another, shake off the excess. When you are completed with each piece of Chicken, set it aside on another plate. Heat the large pan on Medium-High. Add Oil and Butter and heat for 1-2 minutes. 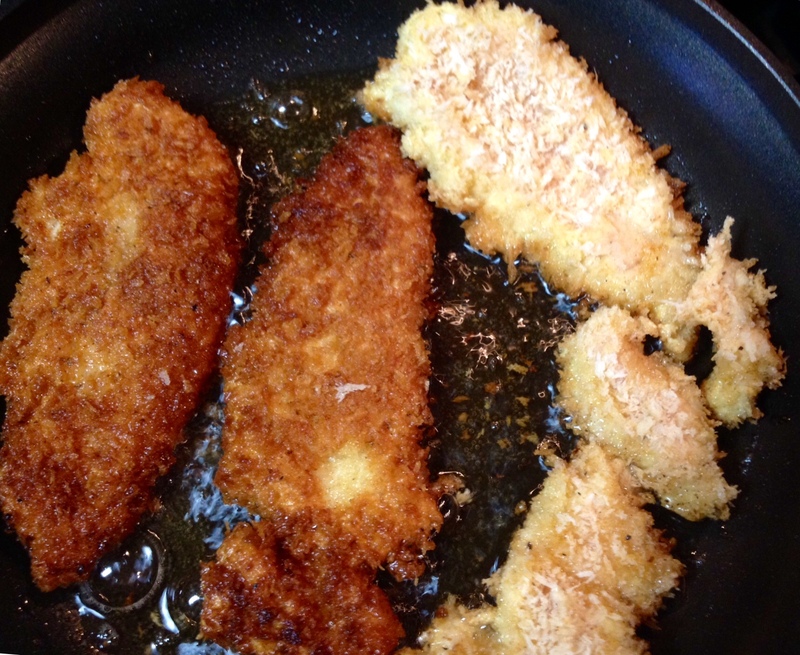 Add the breaded Chicken carefully to the hot oil. Make sure the chicken is evenly spaced in one layer. When the edges of the chicken begin to brown, carefully turn the chicken over. This should take 3-4 minutes for each side. When the chicken has finished, place on paper towels to absorb the excess oil. Serve hot and garnish with lemon wedges. The acid from the lemon cuts the buttery flavor of the breading. Great Bavarian Chicken Schnitzel will definitely up-your-game for a personal Oktoberfest celebration. Plus, its pretty good the rest of the year with some French Fries or homemade Spaetzle. As for the other versions of Schnitzel, this recipe is easily adaptable to classic Wiener Schnitzel (Vienna style made with Veal cutlet) or the common Schweine Schnitzel (made with Pork Loin or Chops). 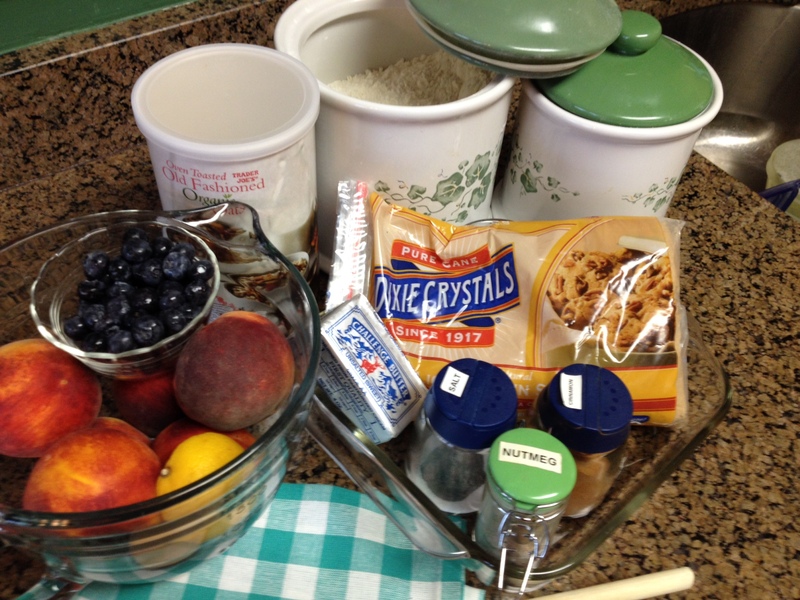 Cobbler, Crisp, and Crumble. Much like hoagies, heroes and subs, we all have our own label for this fresh-fruit baked good. Technically they each have a slightly different twist. 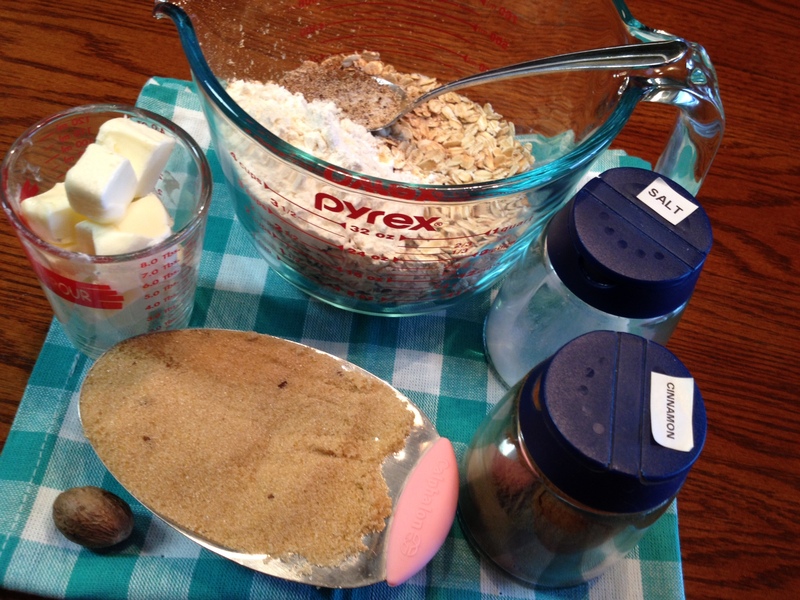 Cobblers have a biscuit-type dough, while crisps may have an oatmeal crust topping. I won’t even get into Brown Bettys, Buckles, and Sonkers. Regardless, I’ve always called mine cobbler. As summer is ending, so is peach season here on the East Coast. 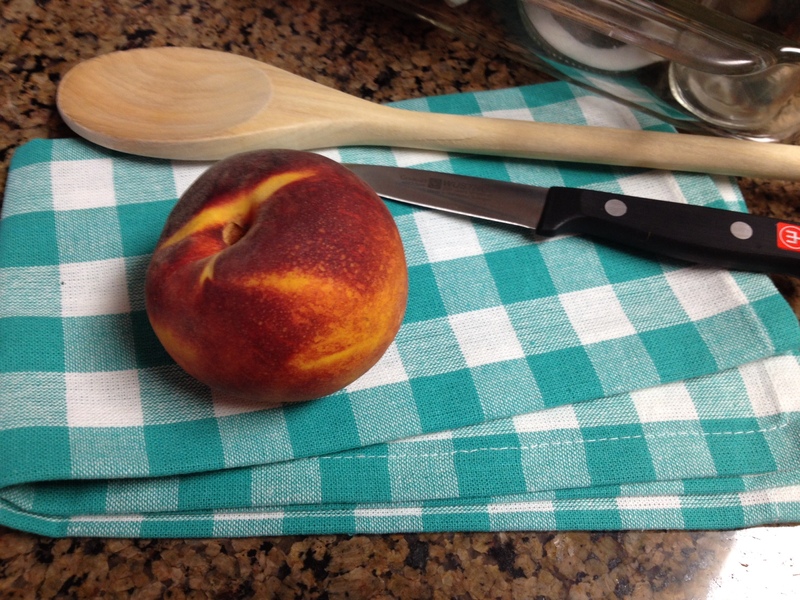 What better time than to share my version of a Peach Cobbler. So get yourself down to the Farmer’s Market and grab a bagful of local peaches. 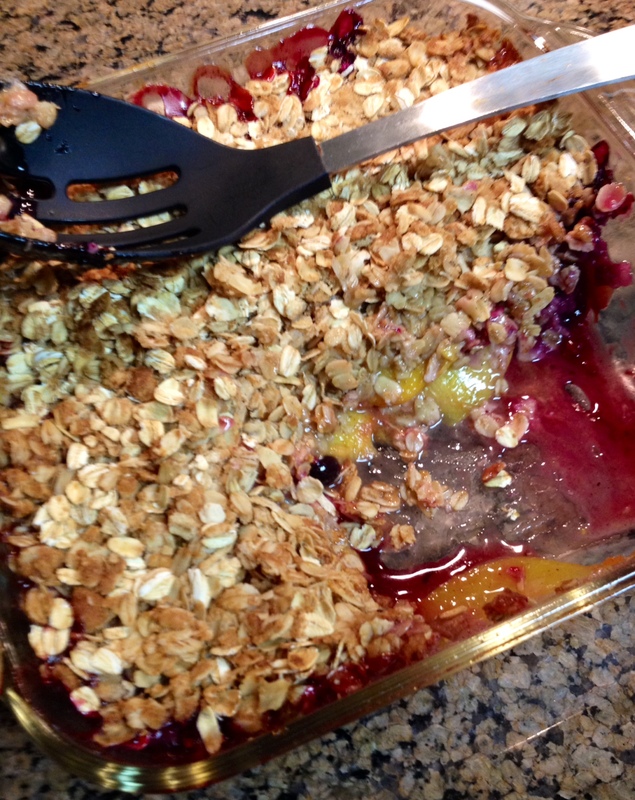 This Peach Cobbler-Crisp-Crumble recipe is sure to make every type happy. 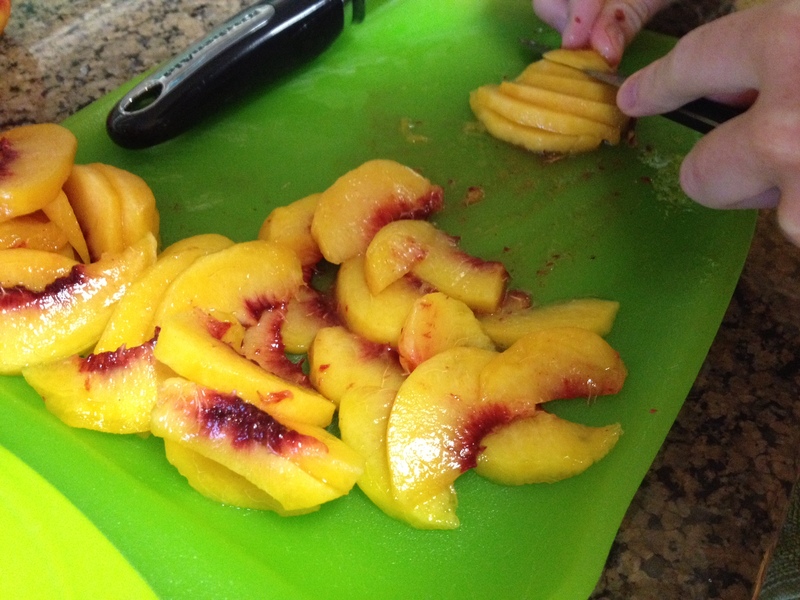 Halve the Peaches with a sharp knife, and remove the pits. 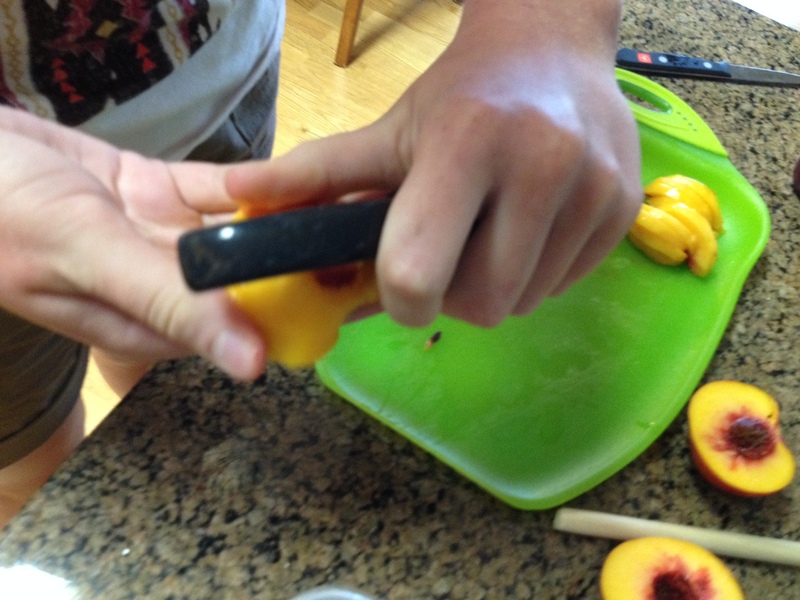 Once the Peaches are cut, it is much easier to remove the skin with a common potato peeler. 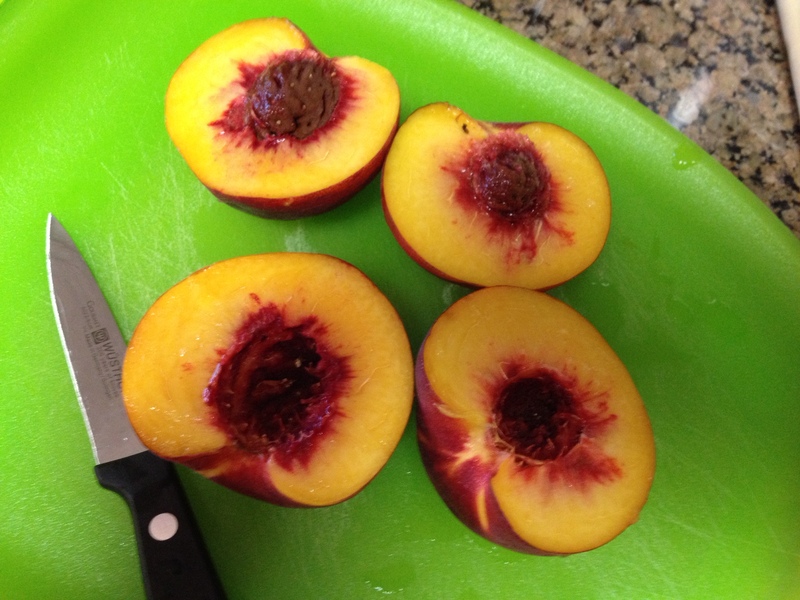 Finally, slice the Peaches thinly and place in a large mixing bowl. 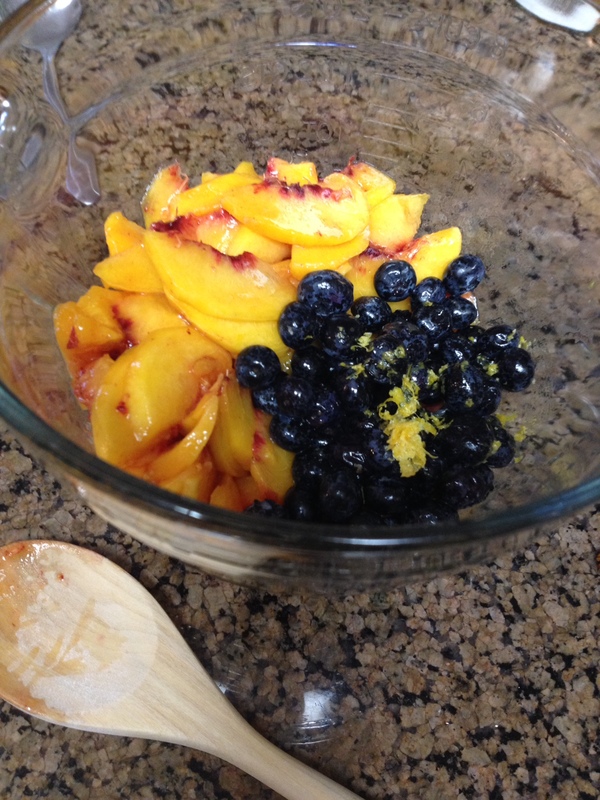 Add to the Peach bowl the Blueberries, the Lemon Zest (using the microplane grater) the Lemon Juice, and the rest of the “Filling” ingredients. Again, use the microplane to grate the Nutmeg. 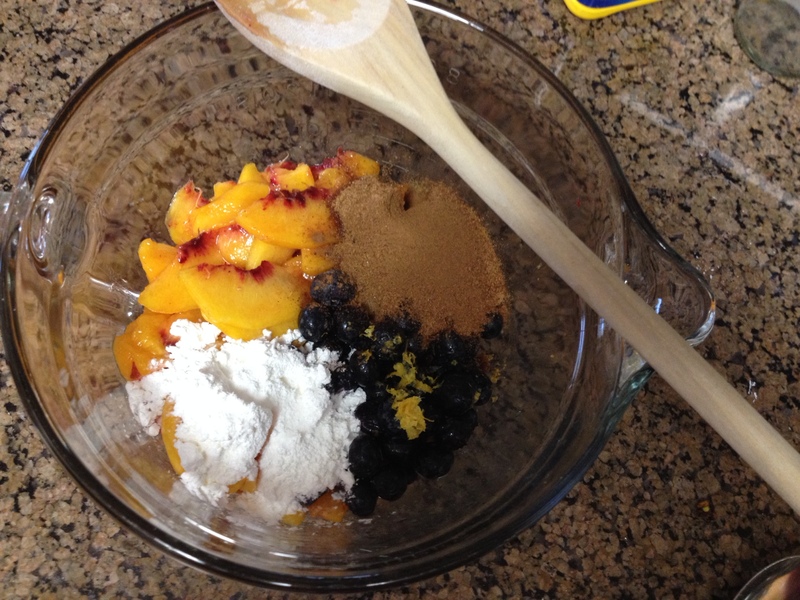 Gently stir the Peach mixture. 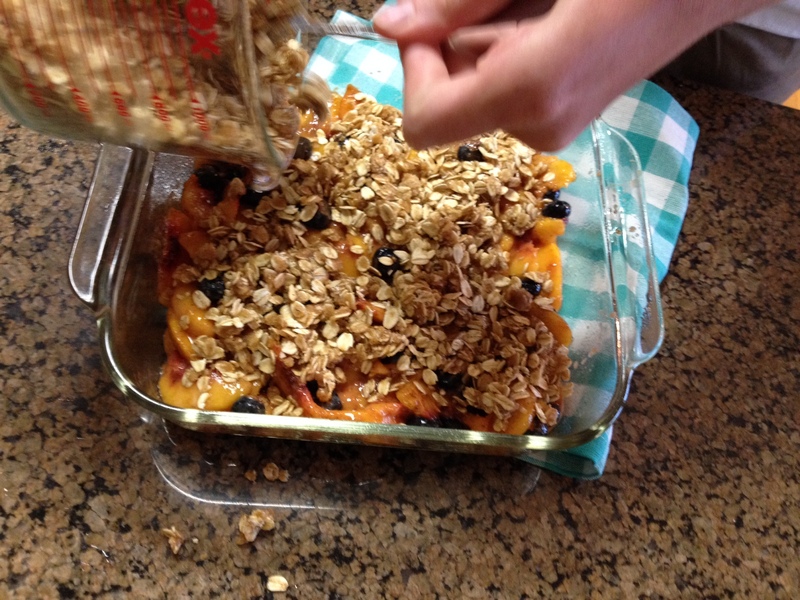 Evenly spread out the Peach Filling mixture in a Baking Pan; I use a square 8 inch x 8 inch pan. 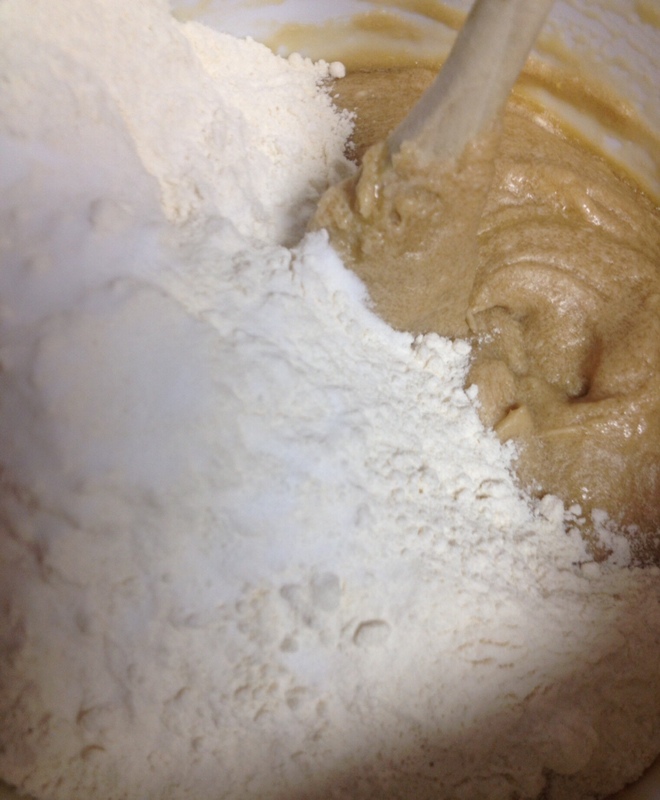 To prepare the “Topping”, gently mix all of the dry ingredients, minus the butter. 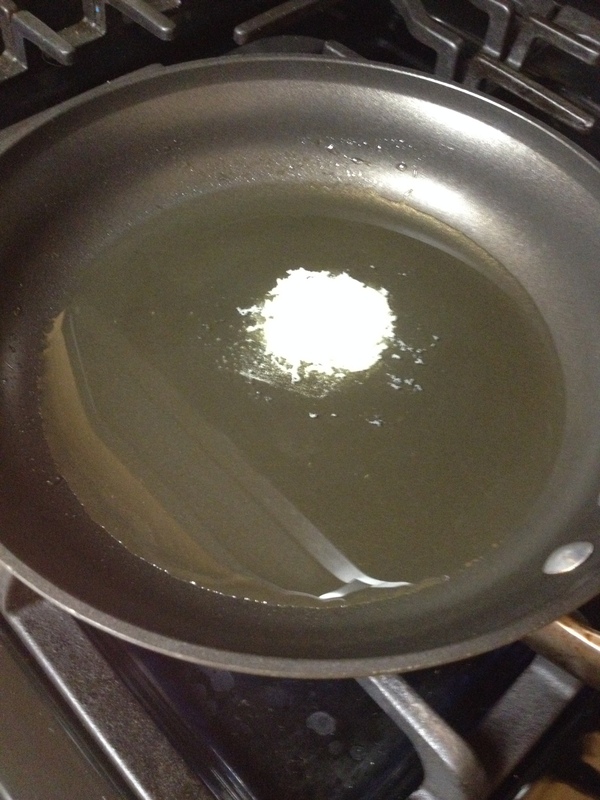 Once mixed thoroughly, incorporate the melted butter. 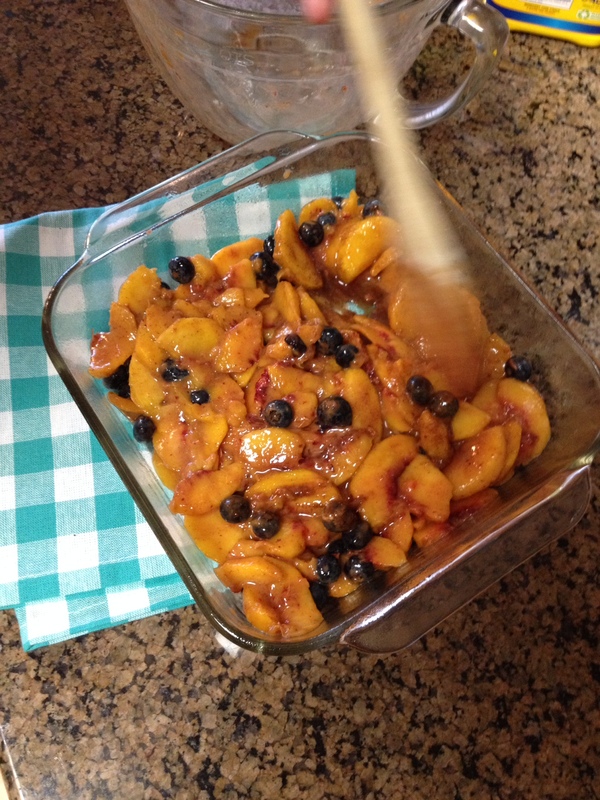 Evenly spread the “Topping” mixture over the Peaches in the baking pan, and gently press the “Topping” with the back of a spoon. Bake at 375 degrees for 25-30 minutes. You will see the top brown and the fruit begin to bubble. Let cool for a few minutes. Once you see the fruit bubble, you won’t wait long before digging in. 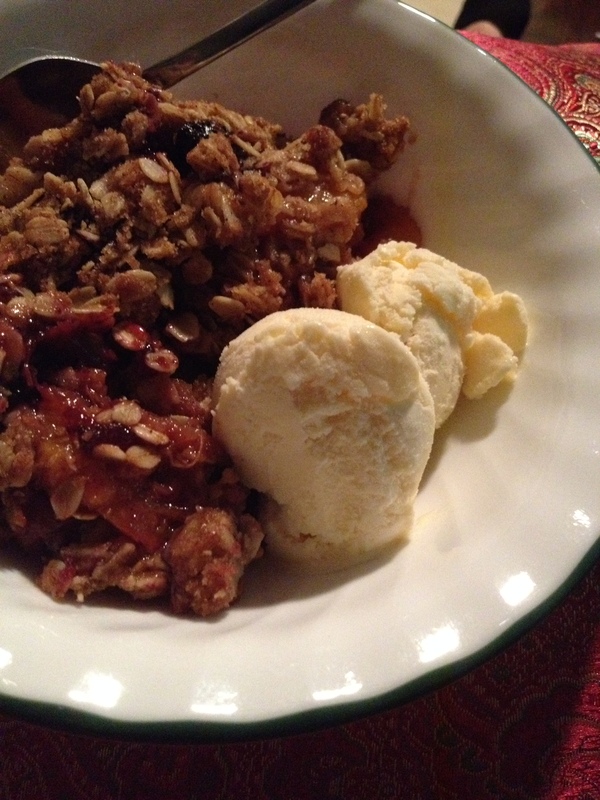 I prefer the comfort of a big bowl of Peach Cobbler with a scoop (or maybe two) of Vanilla Ice Cream. Before I moved to Washington DC, I didn’t think too highly of the city. I thought it would be crowded, cut-throat, and full of crime and corruption. While all of these things are actually true, I found so many other reasons to embrace our nation’s capital. One of these is exploring DC’s different neighborhoods, usually through food. On one recent trek, my husband suggested a sandwich shop he’d heard great things about. Like I said, my exploration drive responds greatly to award-winning sandwiches. This resulted in our exploring the Shaw Neighborhood, in the area of Howard University. The neighborhood is serviced by the Shaw-Howard University Metro Station on the Yellow and Green Line. So pick a good weather day to take the Metro and have a nice walk around the neighborhood. There’s a map at the bottom of this post to help you! We started the day with the primary mission of finding these sandwiches. SUNdeVICH describes itself as being on an alley in a garage. 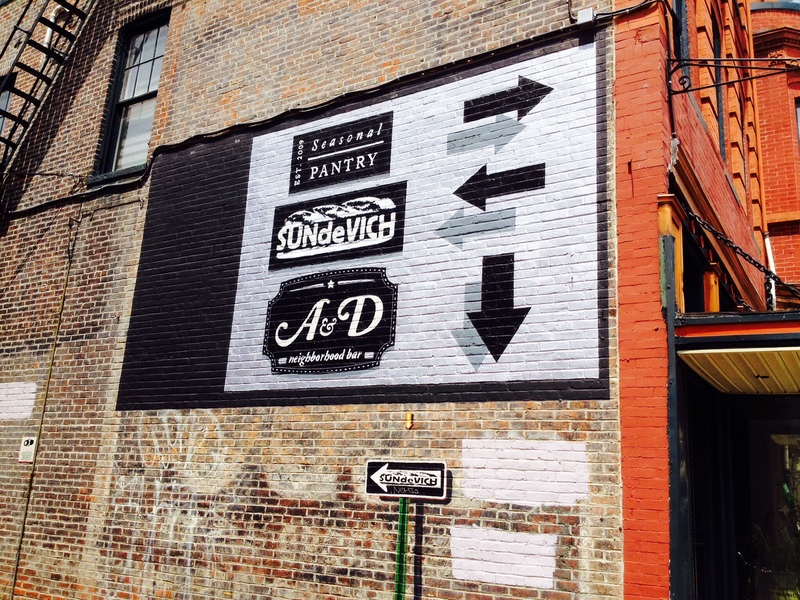 As we walked down 9th Street, the large painted building with directions provided us the proper encouragement to the sandwich shop in the alley garage. As would be expected by a small sandwich shop in a alley garage, the place was packed. Customers making decisions, hungry patrons waiting for purchases, and a lively staff working hard and fast. When we entered we were greeted by the large chalkboard displaying a simple menu. Each sandwich is themed to a world city with flavors and ingredient reminiscent of that locale. As we stood in line, we realized it would be hard to narrow it down to just one choice for each of us. After much negotiating, hubby and I settled on the HAVANA and BERLIN. Our selections arrived about 10 minutes after order. Quite frankly, I thought this was pretty quick considering the large crowd, and the kitchen staff making each 12-inch sandwich as ordered. Let me tell you, the SUNdeVICH team was working hard. The HAVANA sandwich was packed with shredded roasted pork, Gruyere cheese, and finished with pickles and dijonnaise. And the BERLIN was a pretty proper German pork bratwurst, with just enough sauerkraut and mustard to keep it authentic, but not too much to overpower. Both sandwiches were on a fantastic French bread. Let me say, I like my baguette like I like my men…..crusty and chewy 🙂 And I got to have lunch with both that day. Besides sandwiches, SUNdeVICH also had a good looking selection of salads and spreads and sides. I’m sure I will taste them on another visit, but I still have 14 other sandwiches to try! The alley garage sandwich shop will seeing me again soon. After a filling lunch, most girls are in the mood for walking and shopping. I am no exception. We had seen flyers there was a local market near Logan Circle, so we took the short trek in that direction. After circling the Circle, and a few backtracks, we finally “stumbled’ on the DC Meet Market. 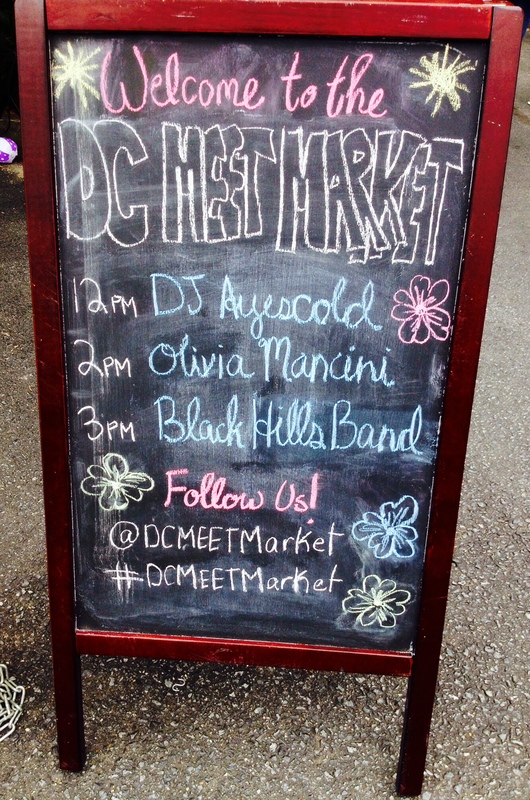 The DC Meet Market is a small, outdoor, community market held in the parking lot of St. Luke’s Episcopal Church. It open the first Saturday of each month, Spring thru Fall. This is a more intimate setting than the more well-known Eastern Market, but it offers more comfort to chat with the vendors and artisans. Each open date they have bands and DJs to entertain the crowd, which kept us in a fun, post-lunch mood. After the market, the deadly eat-shop-eat cycle continued….and onto dessert! At this point, the day was getting hot and we both started thinking ice cream. And then it happened, we walked right under a sign for gelato. I had been to Pitango Gelato before near Eastern Market. On that trip, the staff member allowed my to sample EVERY flavor after telling him I wrote a food blog. 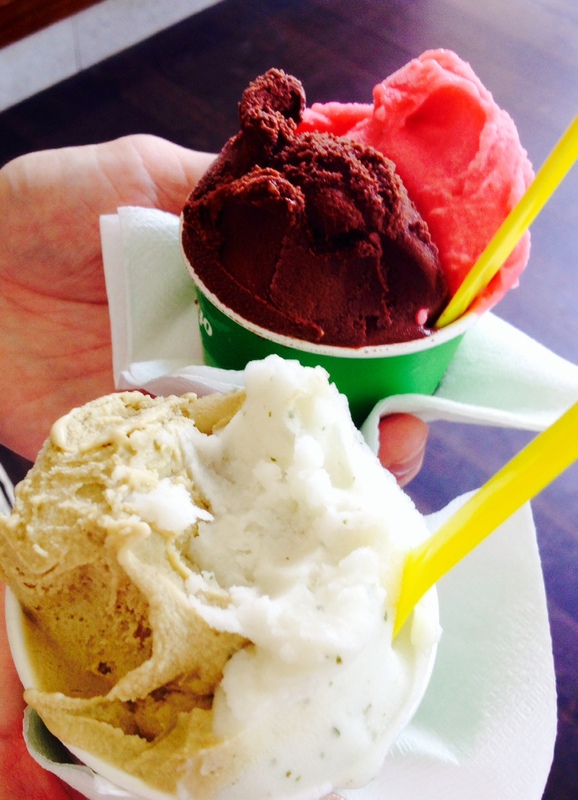 Yes, its shameless, but I don’t forgot the kindness of free gelato. Pitango offers a wide range of flavors, featuring lots of fresh and local ingredients. One in particular that caught my taste buds off guard was the Cantaloupe. I personally don’t care for that fruit, but this flavor of gelato was sweet, creamy, tangy, and has made me a convert. I also highly recommend the Local Raspberry, Pistachio, and Chocolate Noir. I hope you decide to stroll through Shaw Neighborhood during a next visit into the city. 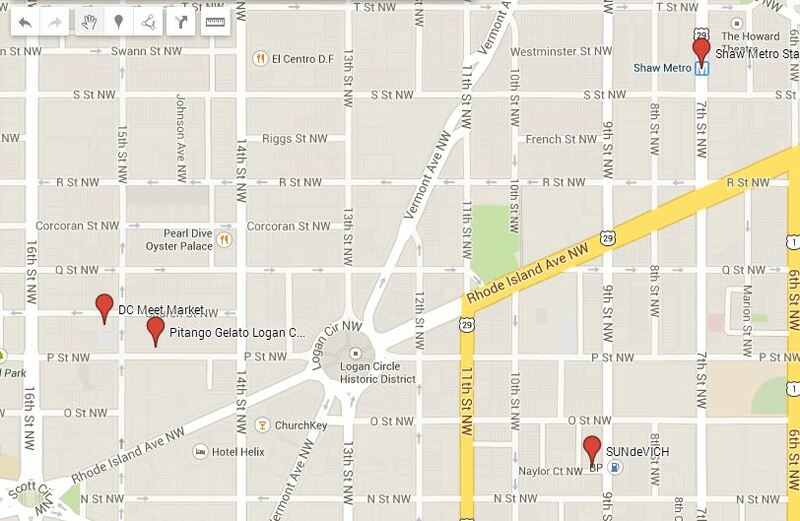 Its a less traveled area than the tourist spots around the National Mall or Georgetown. But, Shaw offers great culinary options, and an established neighborhood full of trees, small shops, and outdoor happenings. What more do I need to say? We all love Bar-B-Que, Bacon is an American staple, and Beer really needs no elaboration. All of these words evoke the idea of summertime picnics and good times with friends and family. 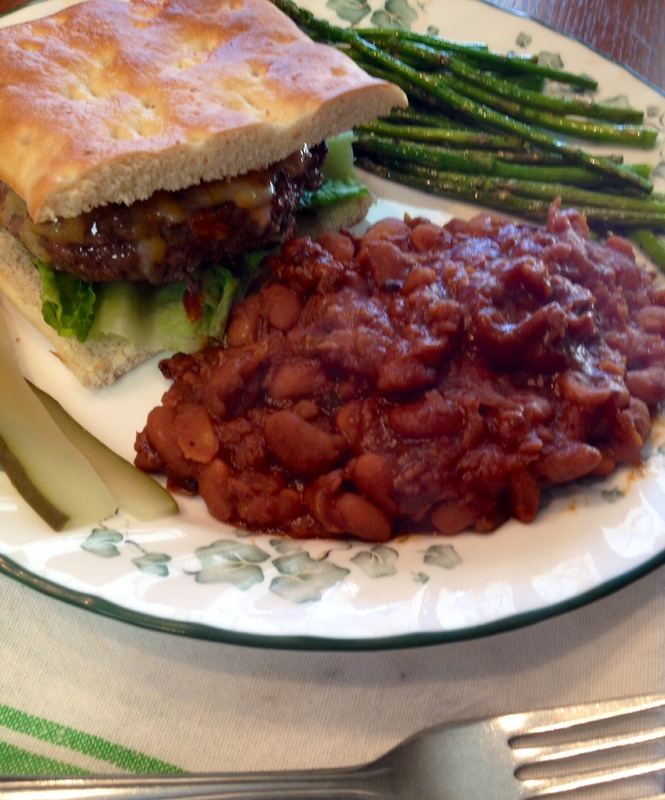 Baked Beans have always been a traditional side dish to grilled hamburgers and hot dogs. After many trials, this version has become a go-to for picnics, get-togethers and BBQs. My father will be happy to see I’m finally releasing the recipe after using him as a guinea pig taster. I know the idea of preparing a simple side for 24 hours seems like a long time. But using dry beans, and giving them an overnight bath in good beer makes all the difference. There are many items in this recipe which allow for creativity: type of BBQ sauce, color of mustard, spiciness level. But please, soak the beans in beer. Beer makes the beans happy, just like it does for you and me. 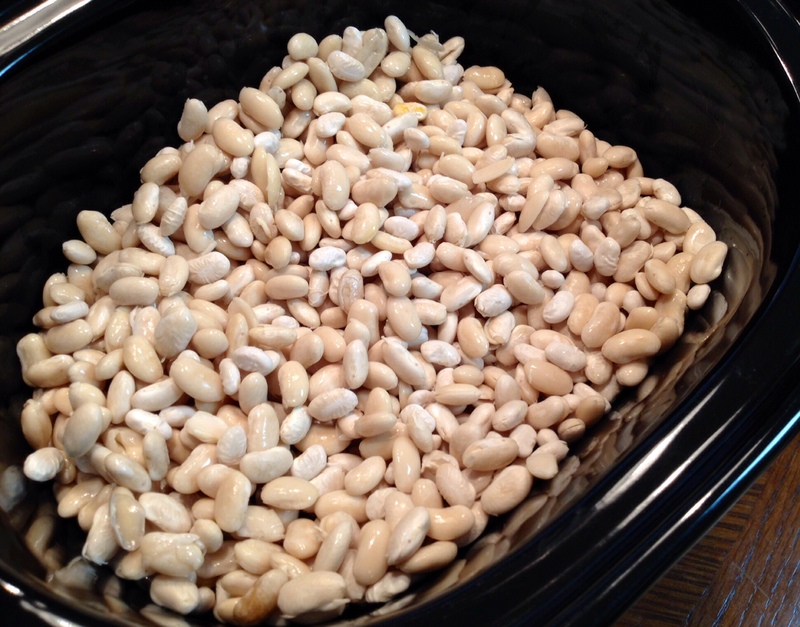 Rinse the dry Beans in a colander, and check for any foreign material (rocks, dirt, etc). 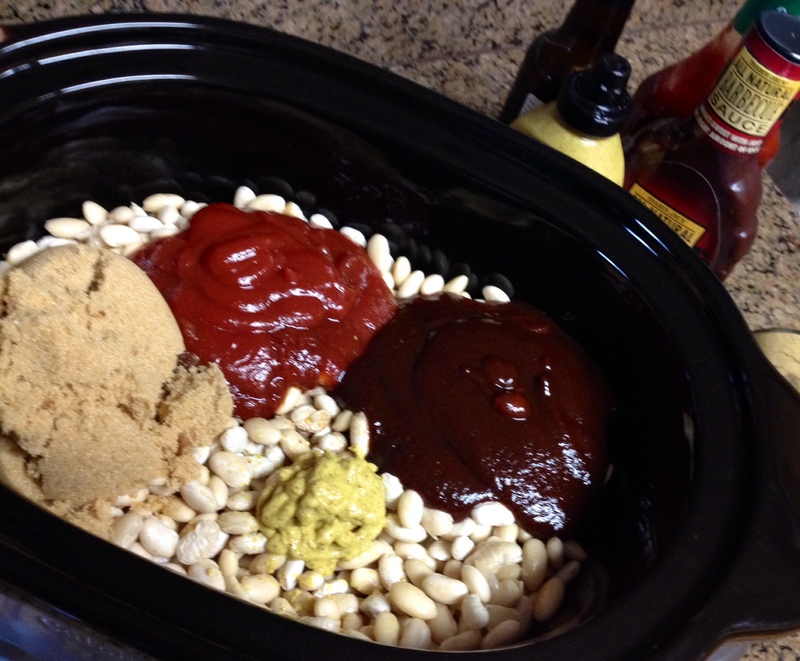 Put the Beans in the Slow Cooker, add the bottle of Beer, and enough water to cover the Beans by one inch. Cover, and allow to sit overnight. The next morning, the Beans will have absorbed all the liquid and nearly double in size. Next, dice the slices of Bacon and a put into a large frying pan on High Heat. Cook until half-way done, about 5 minutes. 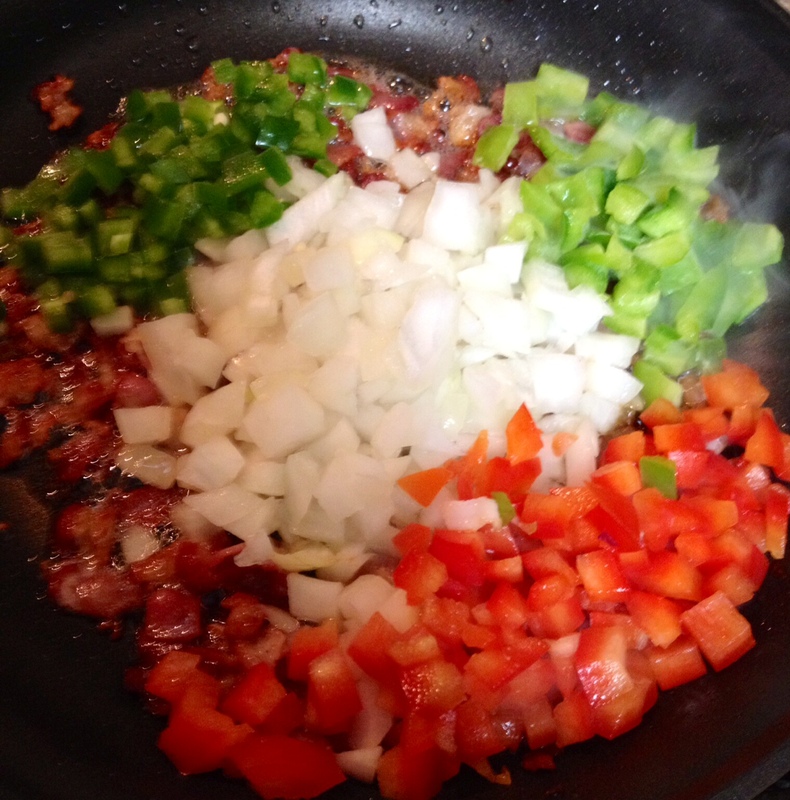 Add into the Bacon the Onion, Bell Pepper, and Jalapeno. 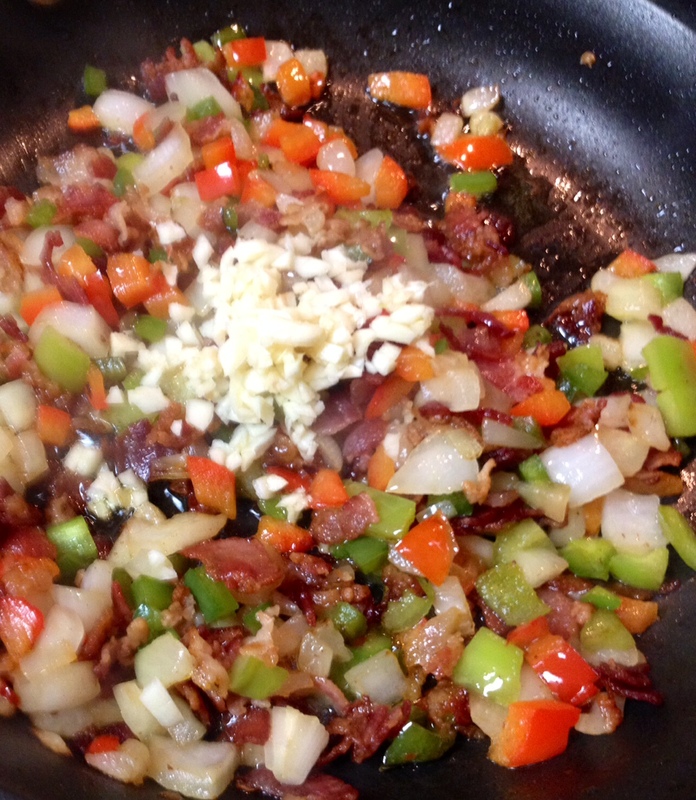 Saute until the Bacon is crisp and the Vegetables are beginning to brown. Add the Garlic, and saute the mixture for 2 more minutes. 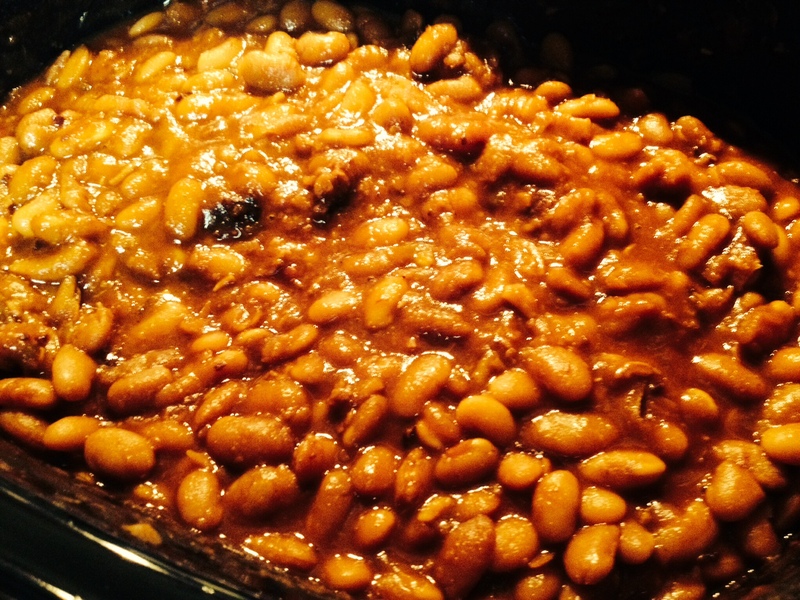 While the mixture is sauteing, you can prepare the Baked Bean sauce. Add to the slow cooker the remaining ingredients. When the sauteed Bacon and Vegetable are finished cooking, add to the slow cooker pot. Add enough Water to cover the Beans by one inch. Thoroughly stir the entire mixture. Cover the pot and turn on the Slow Cooker. Cook on Low for 8-9 hours, or on High for 5-6 hours. Periodically stir the Beans and add small amounts of Water (or extra Beer!) if the Beans appear to be too dry. These Baked Beans are a perfect summertime staple to accompany the burgers from the grill, or a hot dish at a picnic pot-luck. 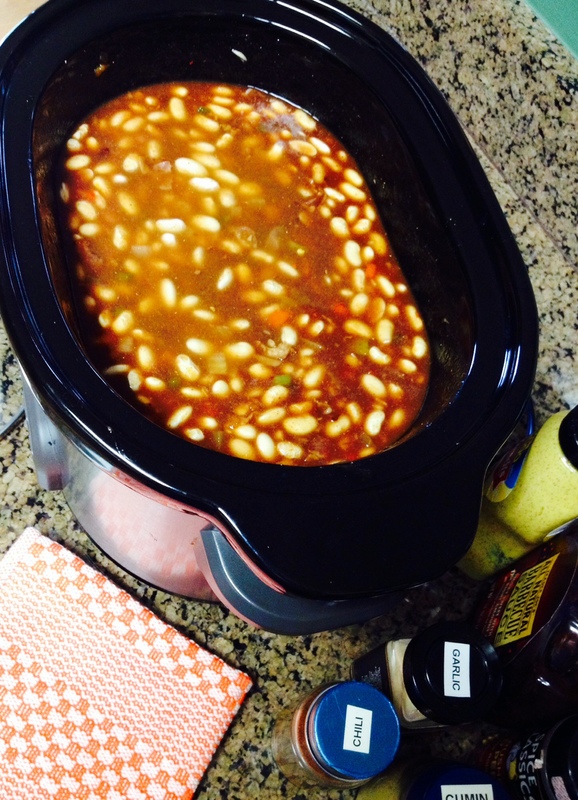 Its also easy to make a double pot and freeze the beans for later. Summer is now more than half over, and the farmer’s markets are in full swing with local fruits and vegetables. For me, this time of year is meant for gorging on fresh blueberries and eating ripe tomatoes as if they were apples. And of course, ears and ears of corn-on-the-cob, dripping in salt and butter. This time of year is also my birthday. 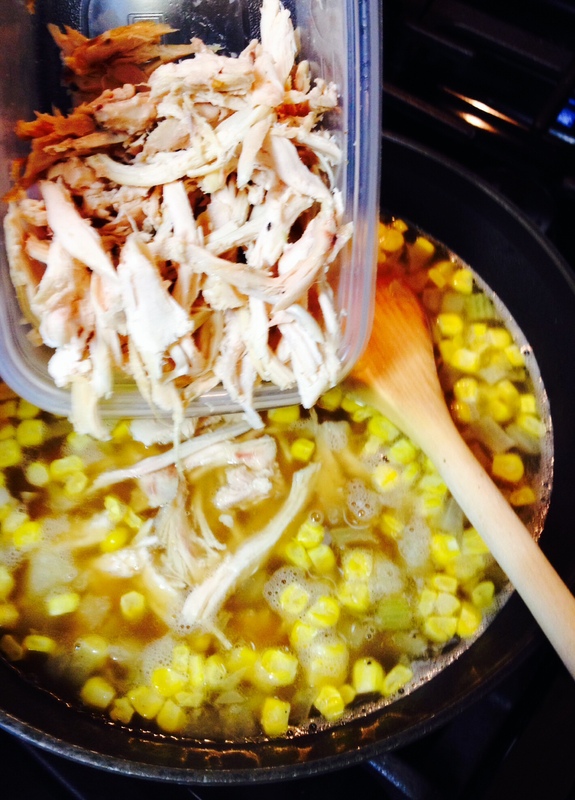 I always equate my birthday with a summertime soup using the fresh corn of the season. And along with the chocolate cake, my mother always made Chicken-Corn Soup for me. Every Pennsylvania Dutch family has their own version of this recipe, some have noodles, while others are made with with small dough dumplings (called Rivels). 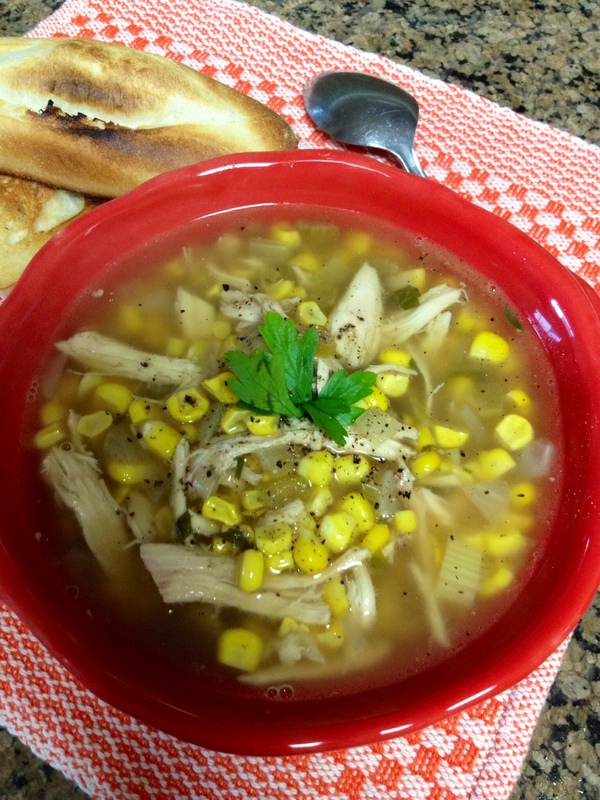 This Chicken-Corn Soup is the one passed by generations of my family. Corn Prep: While its okay to use frozen corn, the summers offers great, off-the-cob corn. Peel the husk and hair from the cob. The easiest way to remove the kernels from the cob is the bowl-in-bowl method. 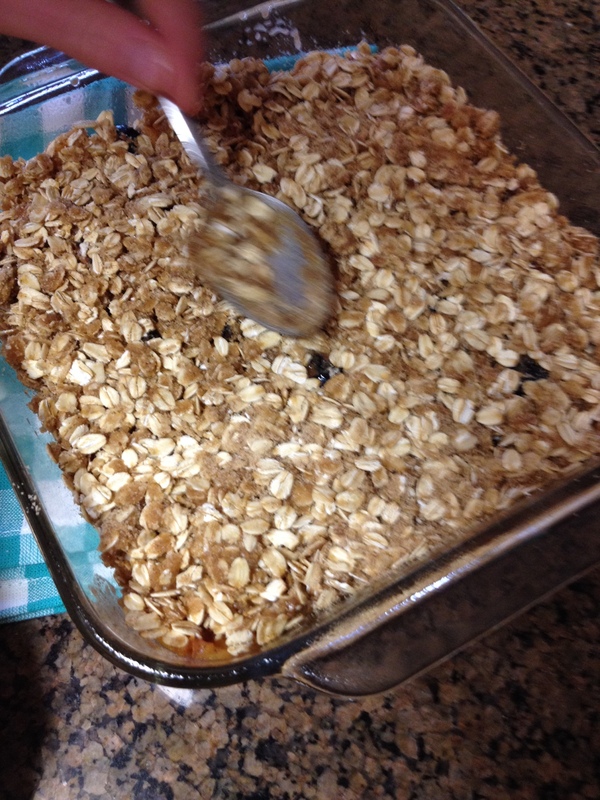 Use a large bowl as a base (I use a pie pan), and a smaller bowl turned upside-down inside. 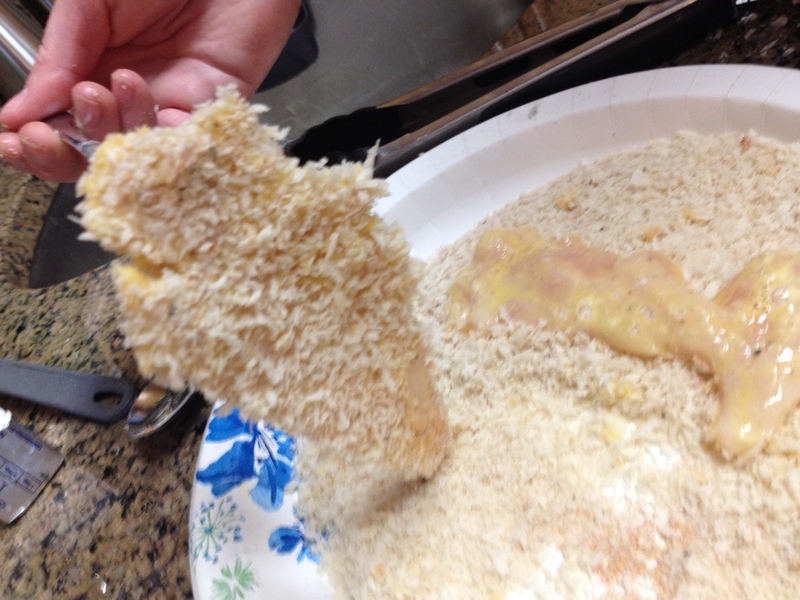 Cut the larger end of the corn cob to make a flat base, and hold it upright. 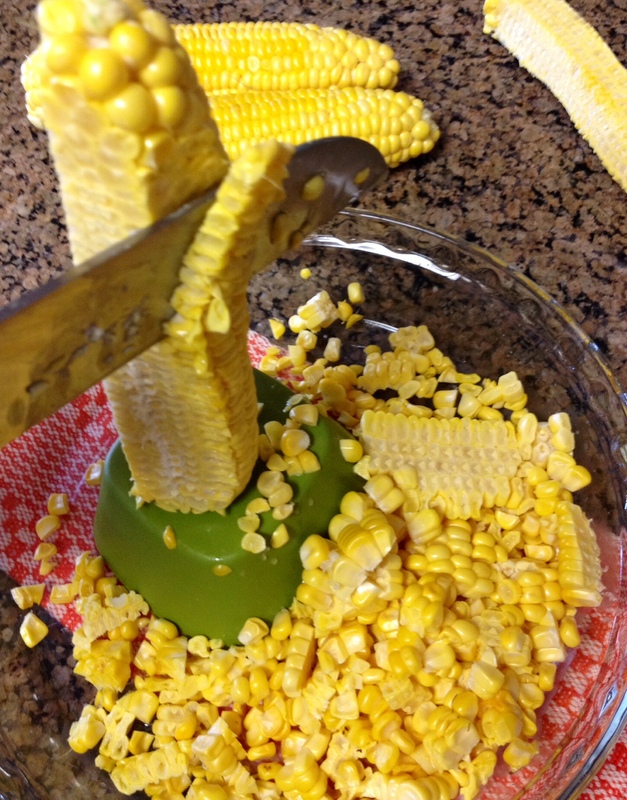 With even downward strokes, slice the kernels off the cob. Spin the cob and repeat slicing until complete. Heat the large pot on Medium-High. 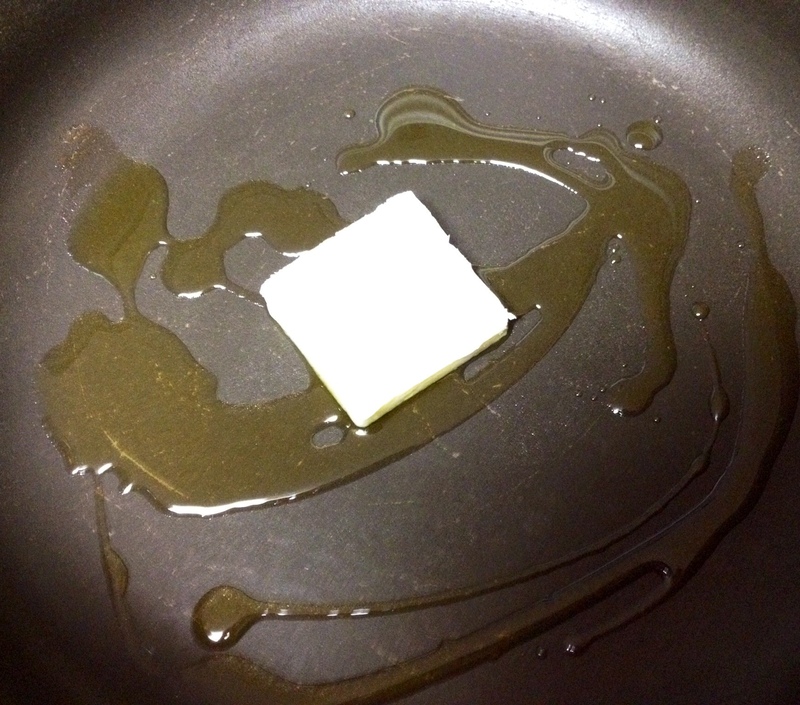 Add a tablespoon each of Olive Oil and Butter. 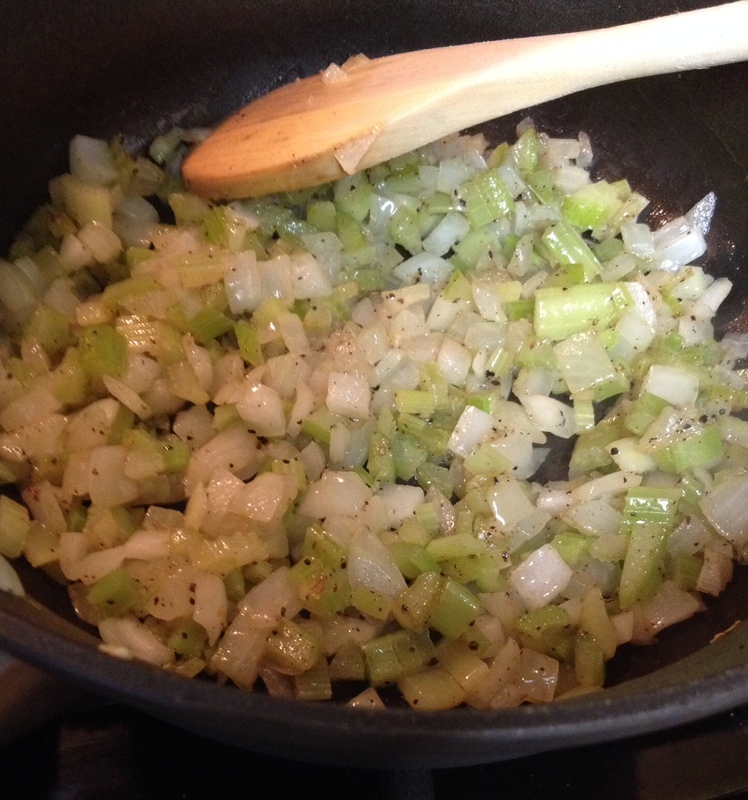 Once the butter has melted, and the Celery and Onions. Add a little Salt and Pepper. Saute the vegetables until they begin to brown. 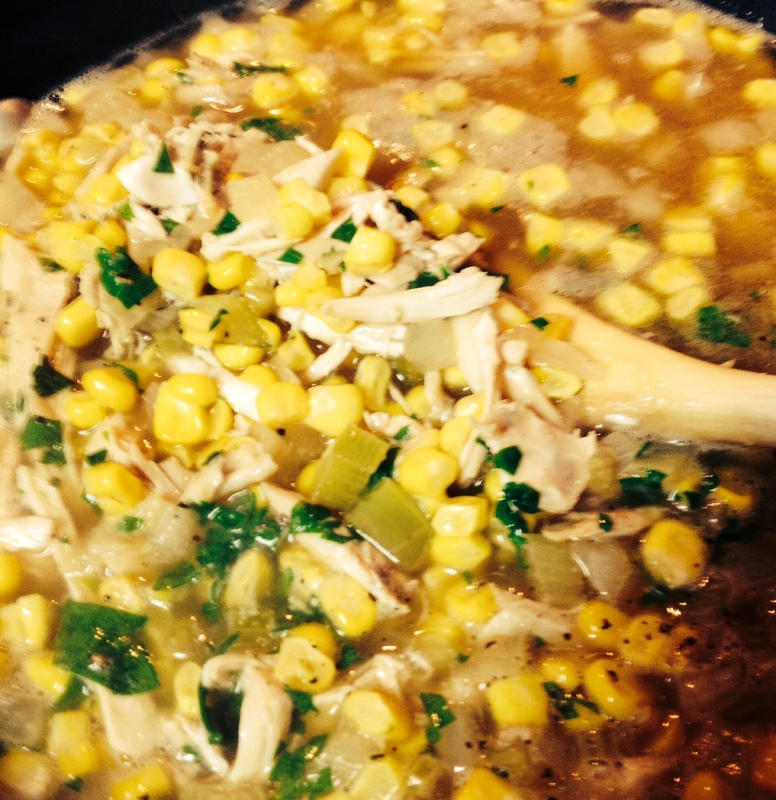 After the vegetables have begun to brown, add the Chicken Stock and fresh Corn. 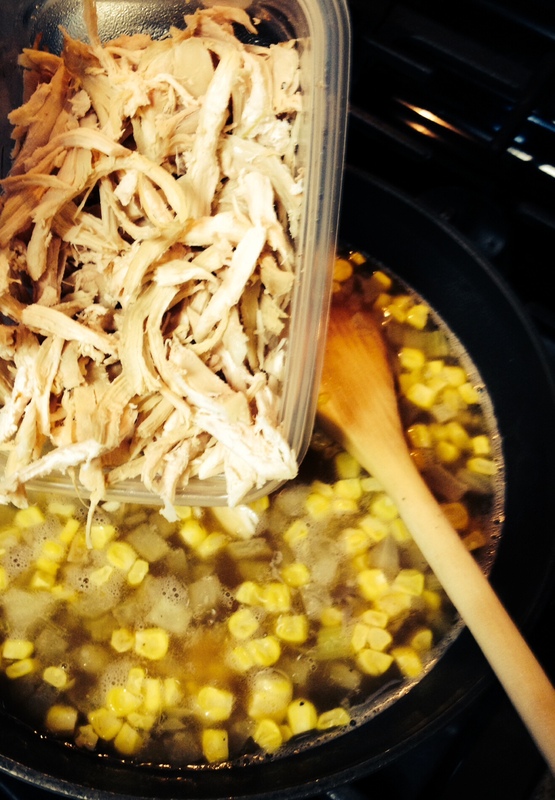 As the stock begins to slowly boil, add the shredded Chicken. Stir and turn the heat to Low. After 10 minutes, the soup will be ready. Prior to service, add the Parsley, optional chopped Eggs, and Salt and Pepper to taste. 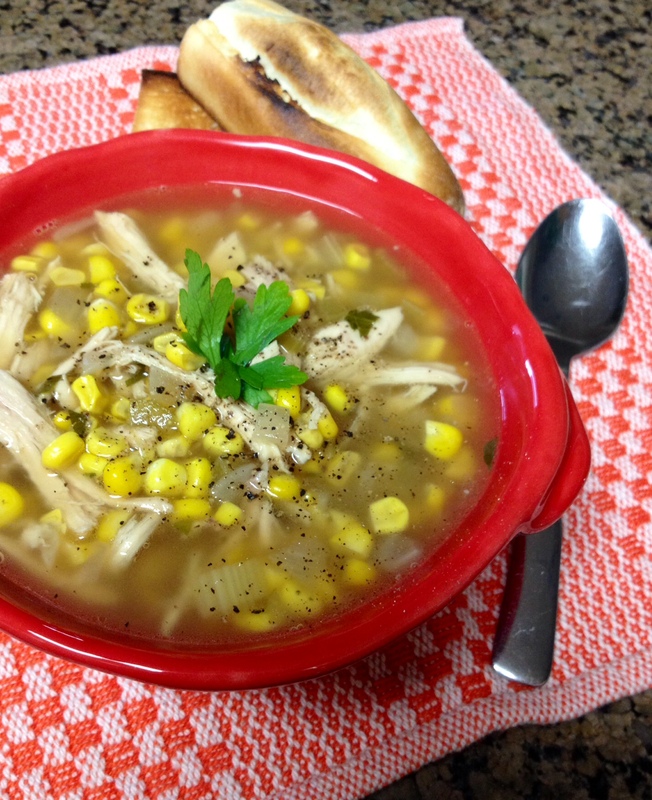 Chicken-Corn Soup with a side of Crusty Bread make for a perfect light and seasonal summertime meal. I admit it. I love coconut. When no one is looking, I will stand over my kitchen sink eating shredded coconut straight from the bag. I feel I got this coconut obsession from my mother and my grandfather (her father). We were the only people in the family each Easter, fighting over the Jelly-Bean dotted Coconut Cake. As an adult, I still make the Coconut Cake each Easter. After this last Easter passed, and while making a batch of cookies, I had a great epiphany…..put the 1/2 bag of leftover Easter coconut into the cookie batter. 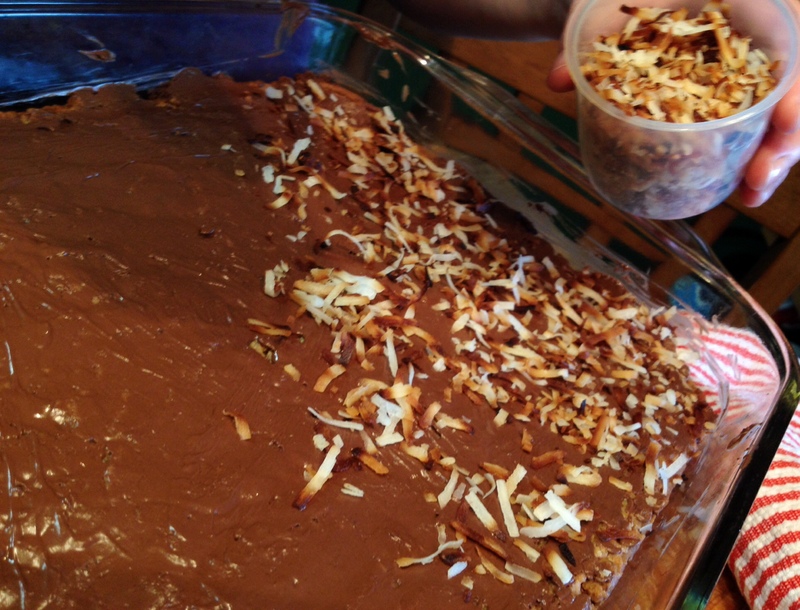 And, because I wanted more coconut, I decided to incorporate more of it on TOP of the cookies. These instructions call for any of your favorite chocolate chip cookie recipe. I still love the simple, classic Original NESTLÉ® TOLL HOUSE® Chocolate Chip Cookies recipe, but any is suitable. Also, if you don’t prefer coconut, it could be omitted or replaced with chopped nuts or dried fruit. 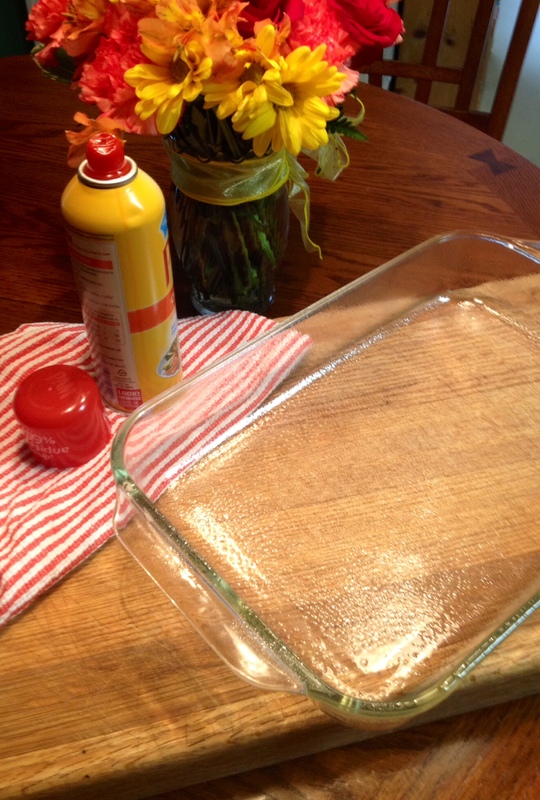 Thoroughly spray the baking pan with the Non-Stick Cooking Spray (I use Butter-Flavored or Flour PAM). Prepare the cookie batter according to your recipe’s ingredients. First combine all of the wet ingredients. 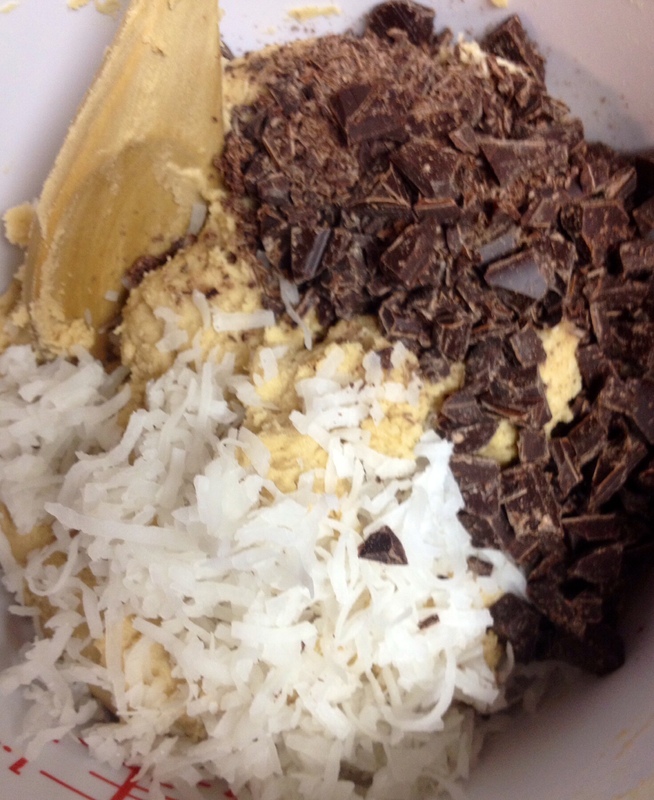 Then mix in the dry ingredients, minus the chocolate chips and the coconut. 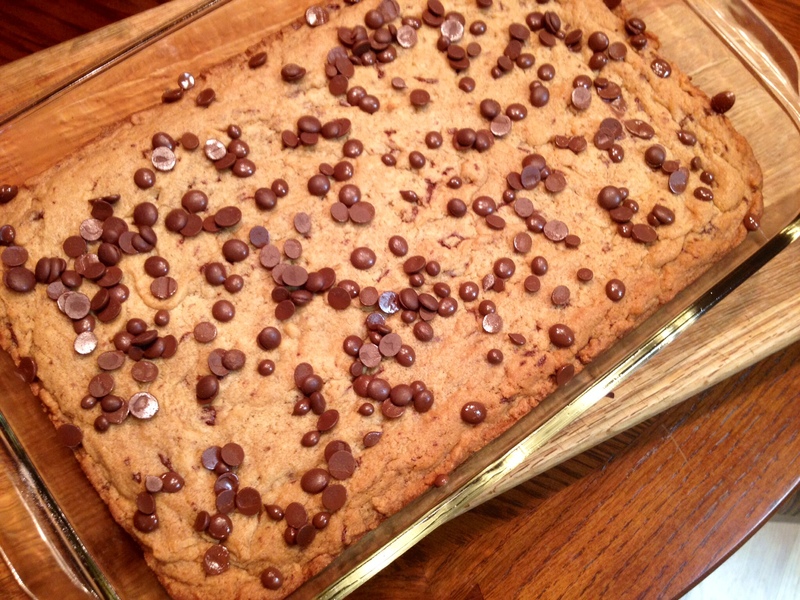 Fold in 1/2 cup of the coconut, and 2/3 or the chocolate chip bag (about 1 cup). Set the rest of the chips and coconut aside, separately. Spread the batter in the greased cake pan, and bake for 30-35 min at 375 degrees. While the cookie dough is cooking, prepare to toast the coconut. 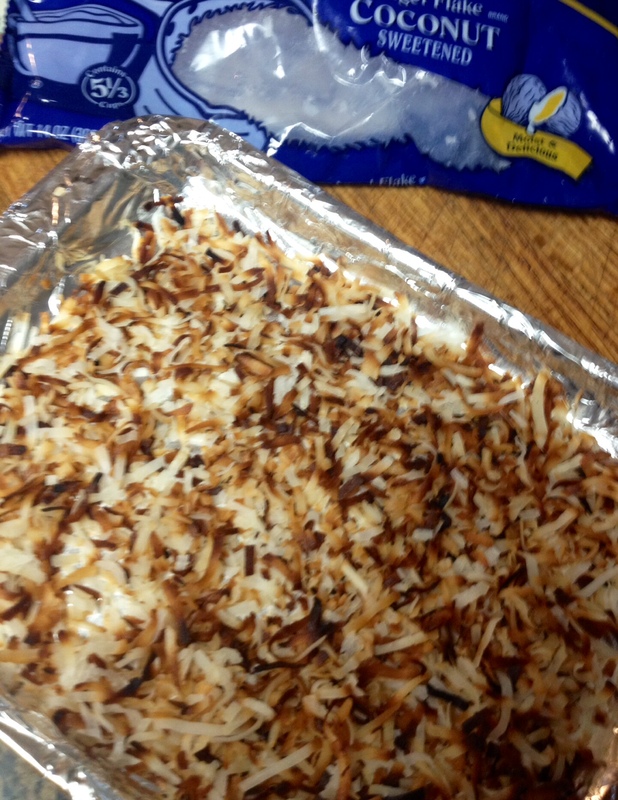 Spread the remaining 1/2 cup of shredded coconut on a small sheet in an even layer. I put mine on a sheet of aluminum foil to avoid sticking and easy cleanup. Place in the same oven for about 5-7 minutes, turning the coconut once or twice for even toasting. Keep an eye on it, or the coconut will easily burn. When toasted, remove the coconut and set aside for cooling. After 30-35 minutes of baking, test the cookie for “doneness.” The batter crust should be firm, and just beginning to brown. If so, remove the pan from the oven. 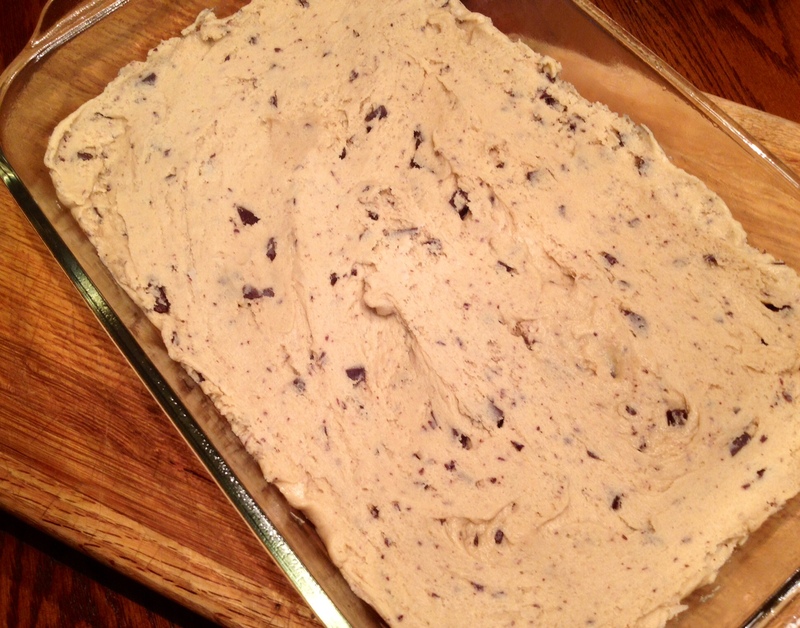 Sprinkle the remaining chocolate chips (approximately 1/2 cup) over the top of the cookie. Place the cookie back into the oven for 3 minutes to melt the chocolate. Turn off the oven and remove the cookie. 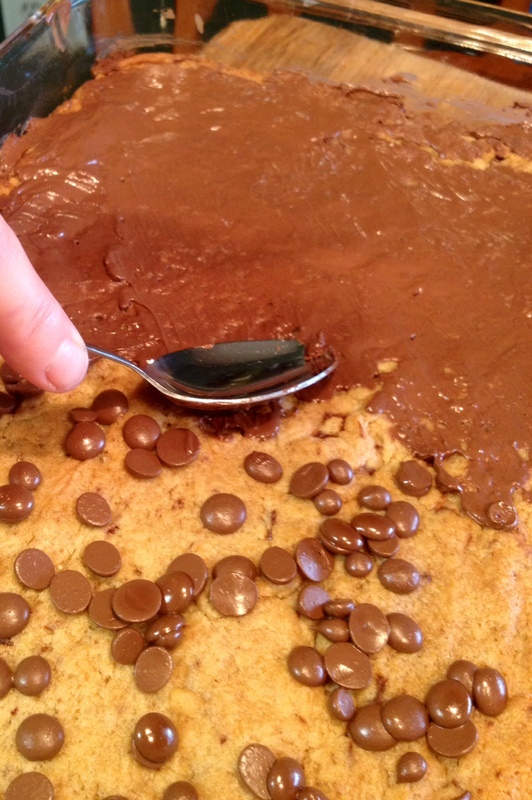 With an off-set spatula (or I use the back of a spoon) spread the chocolate in a smooth, thin layer on top of the cookie. 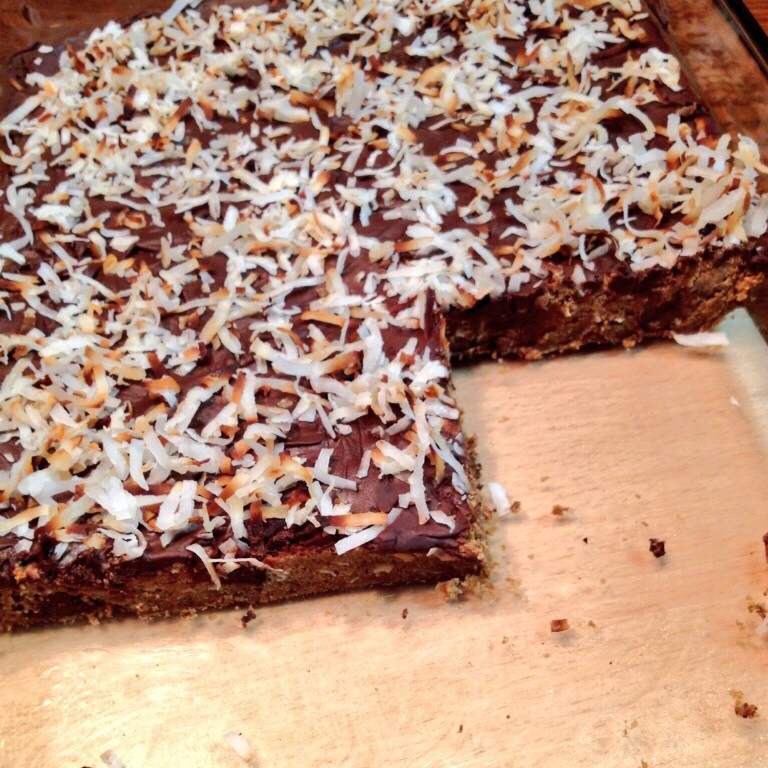 Finally, while the chocolate is still soft and melty, evenly sprinkle the toasted coconut on top of the cookie. 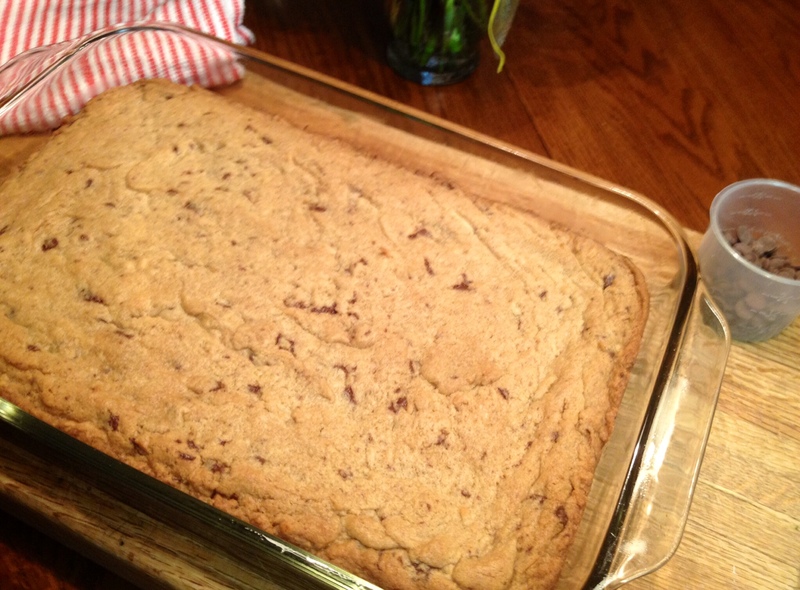 Once the top chocolate is cooled and hard to the touch, slice into bars and enjoy one of my favorite homemade cookies.